The Golden West College Theater Arts department has assembled a talented cast to star in their upcoming production of Dracula by Steven Dietz. Performance dates are October 5 – 14 in the Golden West College Mainstage Theater. Tickets are on sale now through the GWC Theater Arts department website at www.gwctheater.com or through the GWC box office at 714-895-8150. This production contains adult language and situations, and is intended for mature audiences. Starring in this powerful tragedy are Lawrence Hemingway as Dracula with Scott Keister, Patrick Peterson, Katherine Heflin, Carolyn Feres, Alex Jean and Matthew Cobb in starring roles. Director of this production is Tom Amen. 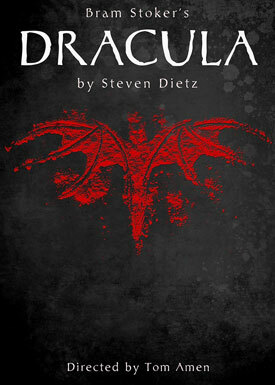 Bram Stoker’s Dracula is as immortal as its title character, and playwright Steven Dietz has done a masterful job of resurrecting the terror and eroticism of the original gothic masterpiece. An ancient horror is unleashed upon the world when a young English solicitor travels to an isolated castle in Transylvania to execute a real estate transaction with a mysterious nobleman — Count Dracula. Landing on the shores of England to occupy his newly purchased home, Dracula soon begins to prey upon the local population, attempting to satisfy his unquenchable thirst for blood with a host of nubile and willing young necks. Ultimately, there is only one man with a chance of stopping the carnage; an aging doctor with a fervent belief in what his fellow scientists consider mere superstition – a belief in the Undead! The Thursday, October 11 performance will be ASL interpreted. Interested ticket buyers need to contact the box office by phone to request locations in the appropriate seating area. Box office number is 714-895-8150.